Join a sharing circle with other women. 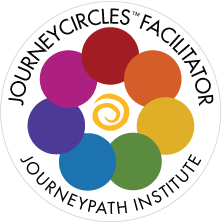 Tap into the energy of the New Moon with a guided visualization and use your Intuitive Mind to find and set soul-intentions for the month as you play in the studio with these juicy new materials and process called JourneyCircles™. Discover a quick-fire creative process using paint and collage to energize your goals, dreams and visions. You will leave with a set of 3 circular collaged mandala cards from your own imagination and intuition that can help guide you throughout the rest of the month. Absolutely no art experience is expected or required.